There is a little piece of Italy hiding in the back streets of Cronulla. Having eaten at Little Italy previously, I knew the food was good, yet didn't quite know why. What I love about writing reviews is that I get to ask a lot of questions and find the essence behind the establishment, we take for granted as a patron. Firstly, this is the only wood fired pizza oven in Cronulla. The pizzas are made by some very passionate Italians. 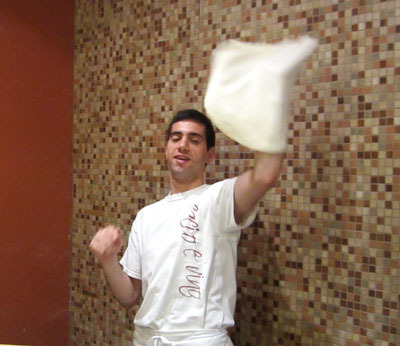 Watching the pizza chef twirl the dough theatrically in the air with ease, I imagined myself putting my fist through it if I tried. These guys make ' pizza twirling' look easy. 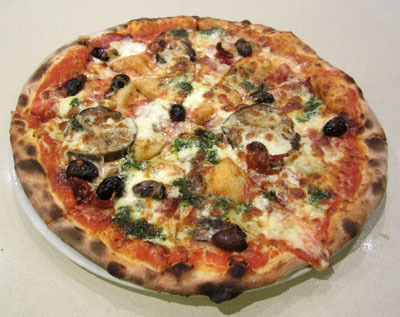 The rounded, stretched dough is placed on a traditional wooden board as generous toppings and herbs are spread across artfully, then sit until they enter the wood fired stone base oven. Hmmm, this may not sound like a big deal, but that is where those subtle earthy flavours come through the pizza base. The menu features around 25 choices including Calzone pizzas. Order the large, you can always take the leftovers in a doggy bag for tomorrow's lunch. The aromas coming from the pizza was authentic Italian. Secondly, the head kitchen chef Josh, began his apprenticeship at Little Italy and finished at Mezzaluna in Potts Point, then on to the well known Beppi's Italian Restaurant before returning to Little Italy in Cronulla for a lifestyle change. Italian food is in his blood, through and through. He believes you need the freshest of ingredients available to produce great food. I heard the gnocchi is to die for. Unfortunately, by the time I arrived, it was sold out. I am always a little hesitant ordering prawn dishes as most are over cooked, destroying their texture and flavour, yet the Spaghetti and Prawn dish was strongly suggested, so I gave it a go. Crossing my fingers as I popped a prawn into my mouth, ahhh perfect, succulent and velvety, then the flavours of the chilli, fennel, rocket and tomato came to life, a great combination. The handmade pasta didn't disappoint either. This could possibly be their signature dish. 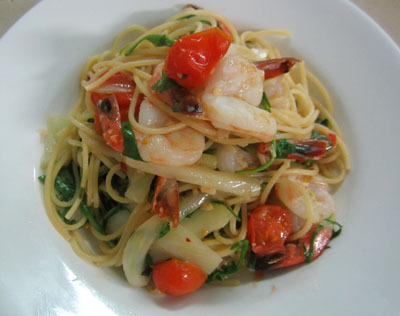 Spaghetti with prawns, chilli, fennel, rocket and tomato - a dish to delight your palette. There are 12 dishes to choose from, then decide which pasta: spaghetti, penne, tortelllini or gnocci. Around $19. Risotto is a simple yet difficult dish to master and can be the death knell for any restaurant, they either get it right or they don't, nothing in between. Oh thank goodness, they got it right, the flavours are sensational and the rice is cooked to be still firm with just the right amount of moisture. Goldilocks would be proud. 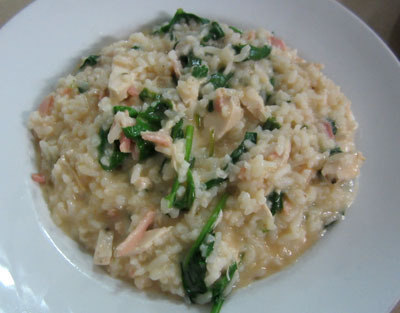 Risotto Alla Contadina - roasted chicken breast, bacon, baby spinach and Parmesan cheese. A choice of four risottos, at $19. 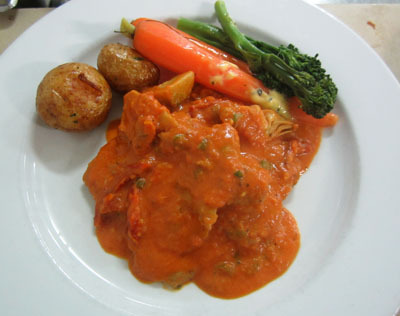 Visually, their veal and beef dishes give a nurturing and homely feel served with whole baby carrots, potatoes and broccoli. The colours and simple presentation excite your eyes and you just want to tuck in. 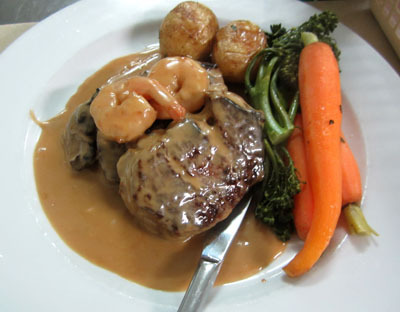 Terra d Mare - Tender fillet steak with prawns in a port and cream sauce. 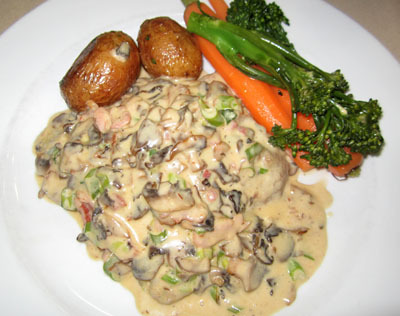 Veal and beef dishes start from $22. 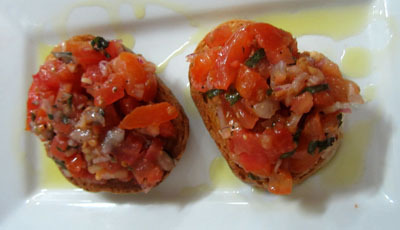 Garlic and herb breads @ $4 and a traditional Brushetta @ $12. 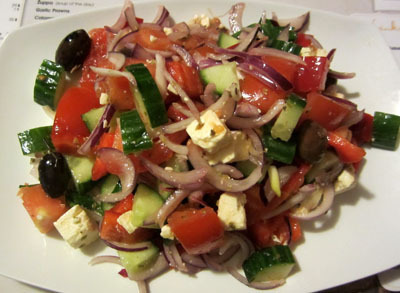 Oh I know this is not Italian, but everyone one loves a good Greek Salad. Italy and Greece are close enough to include this on the menu. Generous salads are priced at $11. Room for desert? Not this time around. Memo: 'Eat less to make room for dessert', in case I get carried away, went into my diary again. The dessert menu looks divine, Gelato Trio, Baileys Creme Brulee, Sticky Date Pudding, Tiramisu, @ 10, Dessert Pizza @12 and a decadent Dessert Tasting Plate @17. Hmm probably this will be my choice next time. 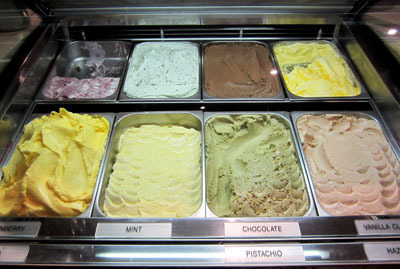 Gelato flavours are especially created by Award winning Frangipani Gelato in Cronulla. Frangipani Gelato Bar creates specialty flavours exclusively for Little Italy. As with all Italian families, they love and include children when it comes to food, so bring your children along and let them choose from the Bambini Menu @10. Want to stay at home and watch a good movie? Call them on 9527 7107 or go to their website to order online, and the food will come to you with their fast delivery service on their Italian style 'scooters'. If you want an Italian inspired wedding or function, book the upstairs Belvedere Room and salivate over their Functions Menu and Wine List. 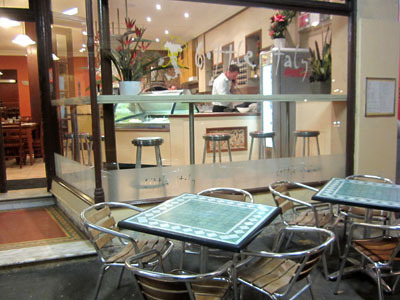 Little Italy has a great history and success story, originating in Allawah they now have restaurants in Cronulla, Jannali and Thirroul in the south of Sydney and in Croydon Park in Sydney's inner west. Priding themselves on "serving the most authentic home style Italian food, with quality and taste that has not changed since its original inception, a value for money dining experience." 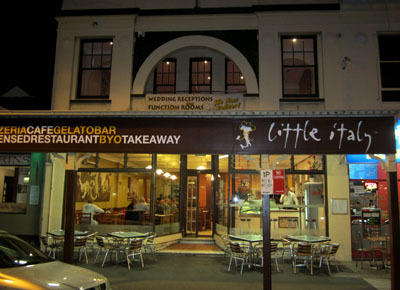 Here is a snippet of interesting trivia: Little Italy is located in a heritage listed building. Built in 1898 by Mrs Giddings and run as an Italian restaurant ever since. The current owner, Martin, has been operating the restaurant for the past 13 years. That equates to 114 years of Italian cooking, perhaps that is another reason why the food tastes so good. A great place for couples, families or functions. They cater to everyone who enjoys good Italian food.